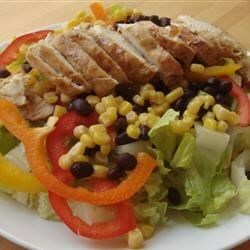 "Delicious Southwestern twist on the classic Caesar Salad (Cesar in Spanish) with chipotle dressing. It makes a beautiful presentation for you and your guests. Serve with warm flour tortillas." Sprinkle chicken breasts with fajita seasoning, and grill for about 4 minutes on each side, or until no longer pink and juices run clear. Allow to cool, then slice into bite-size strips. In a blender or food processor, combine mayonnaise, grated Parmesan cheese, sour cream, anchovies, green onions, parsley, Dijon mustard, chipotle pepper, garlic, and Worcestershire sauce. Blend until smooth. Place romaine lettuce in a large bowl, and top with croutons, shredded Parmesan, and red, yellow, and orange pepper rings. Arrange chicken on top, then pour on the dressing. This was an easy recipe. I used all fat free ingredients and it still turned out good. I also added black beans and mexican corn.